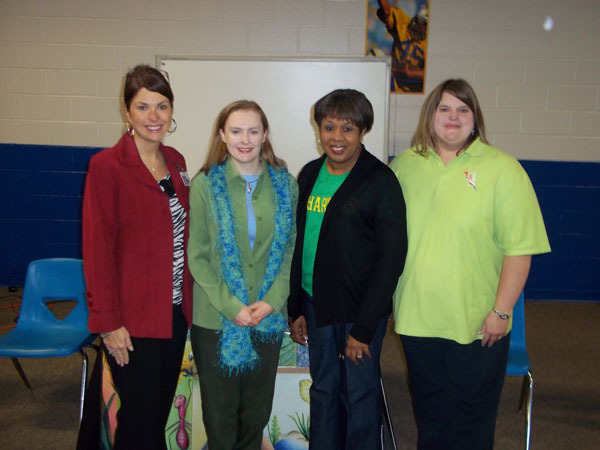 I spent the day at Farragut Primary in Knoxville, Tennessee, on January 19th, 2012. 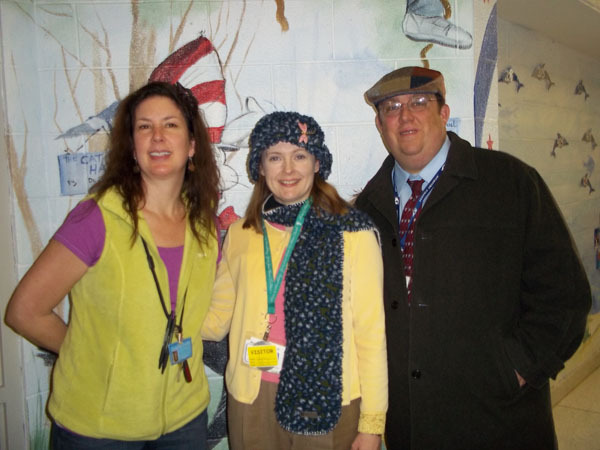 Farragut Primary's Librarian, Wendi Lesmerises (left), Tammy Bronson (middle), and Matthew Bronson (right). With over one thousand Kindergarten through 2nd grade students at this school, the librarian and teachers did an outstanding job sharing my stories with all the children prior to our visit. 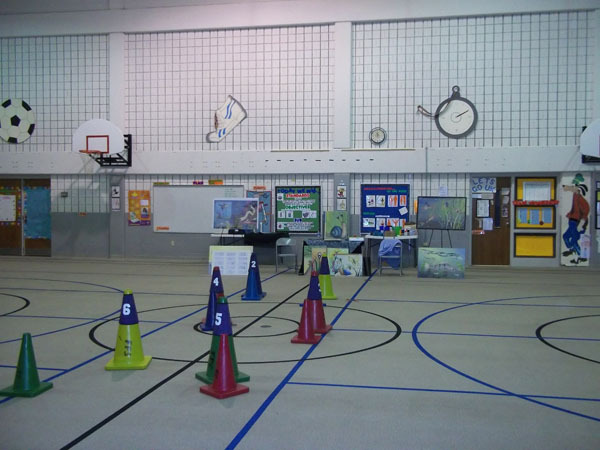 We needed a very large space to accommodate five classes at a time (~150 students), so we set up in the school’s gym. 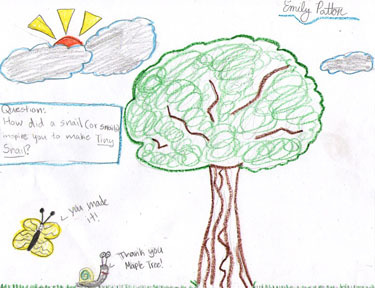 My program is designed to inspire children to create their own picture books. 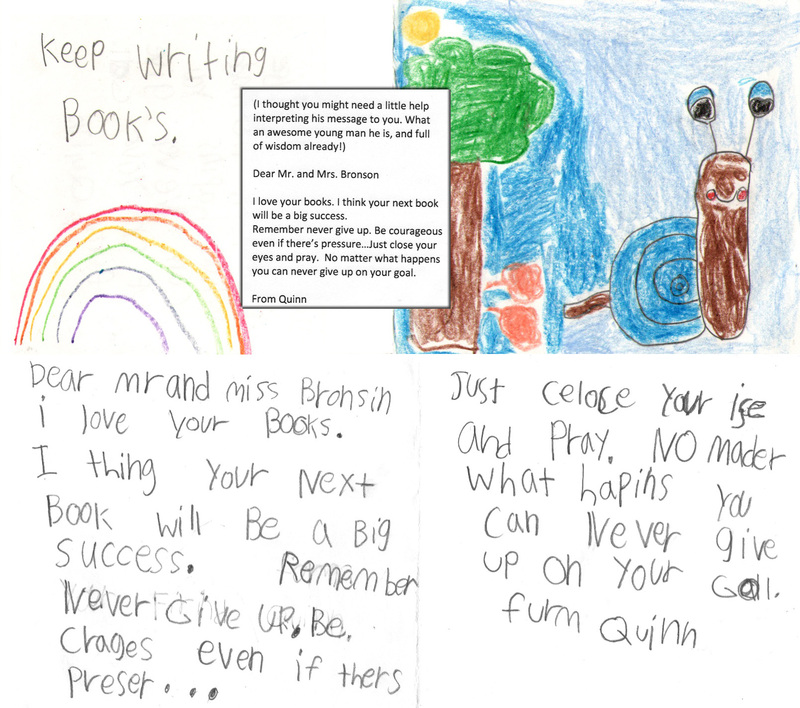 Generally kids make their own book after my visit, but at Farragut Primary two sisters combined their talents to create their own book prior to my arrival. 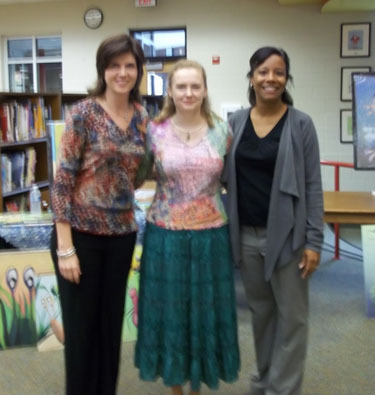 Tammy (left) with author Abigail King (middle) and her teacher, Katie Wheeler (right). 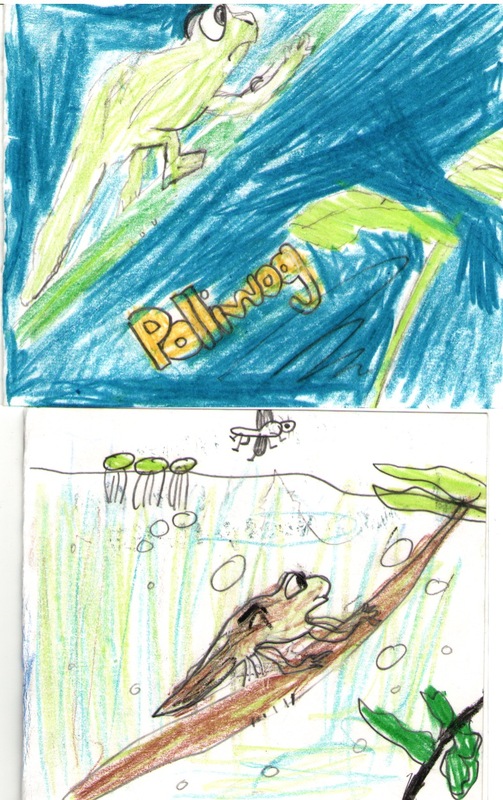 The author, Abigail King (2nd grade), said that my book, Polliwog, inspired her story entitled, Lilly Pad the Tadpole. 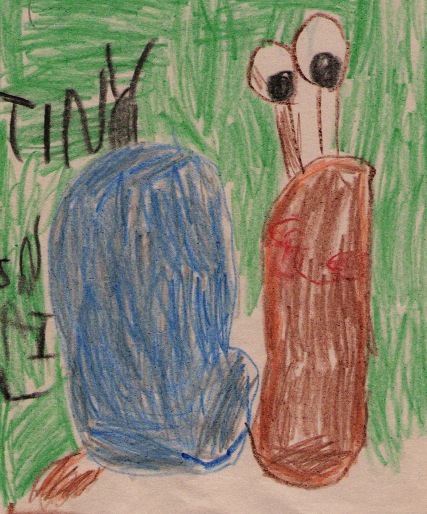 Her sister, Jessica King, illustrated their story. 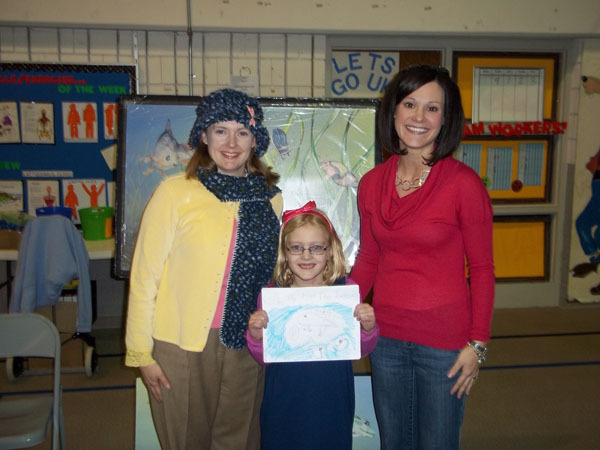 Lilly Pad the Tadpole, a picture book by Abigail and Jessica King at Farragut Primary. 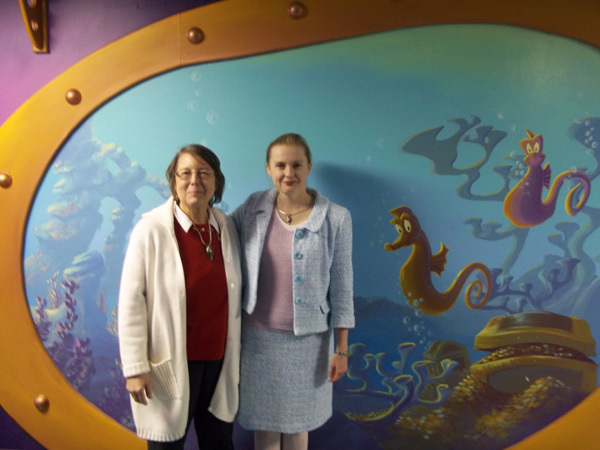 Many thanks to the King sisters and Abigail’s teacher, Ms. Wheeler, for giving me this imaginitive story. I’m glad Lilly Pad learned to swim! 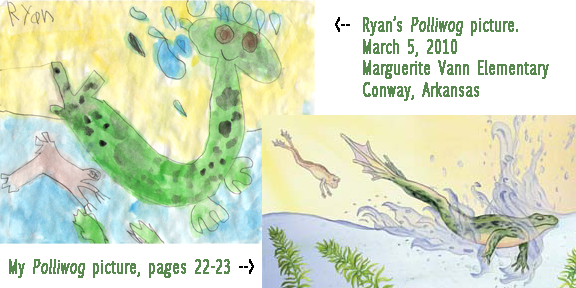 Read Abigail’s book, Lilly Pad the Tadpole (PDF). My second picture book, The Kaleidonotes & the Mixed Up Orchestra, is often used by instructors to teach children the instruments of the orchestra and where they sit on stage. The number seven is repeated several times in this book. 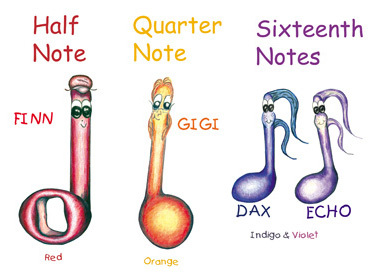 There are seven characters, and each name begins with one of the seven notes in the musical scale: Amos, Bo, Cloe, Dax, Echo, Finn, Gigi. 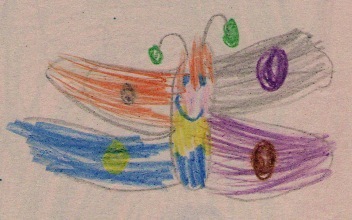 There are also seven colors represented (one for each character): red (Finn), orange (Gigi), yellow (Cloe), green (Amos), blue (Bo), indigo (Dax), violet (Echo). The book’s themes include cooperation and teamwork. Map illustrating where instrument groups are usually positioned on stage in the orchestra. Why do the notes face the wrong direction? The notes have popped off the page and are three dimensional! When they interact with the instruments of the orchestra, sometimes they turn and face another direction. Why are the notes not black? Rather than color each note various shades of black, I decided to make the book more colorful by assigning a color to each note. 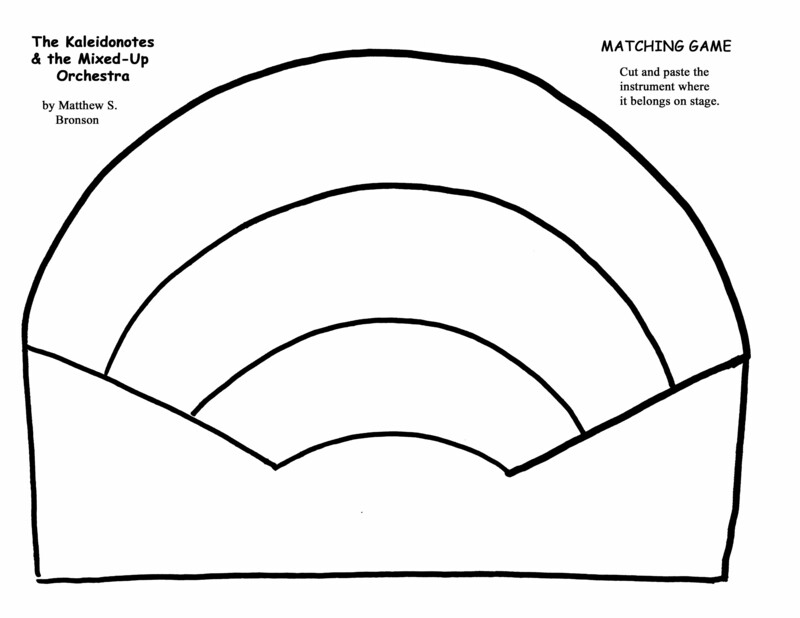 Since there are seven notes, it made sense to use the seven colors of the rainbow. Where did the name ‘Kaleidonotes’ come from? ‘Kalos’ is Greek for ‘beautiful’, and ‘eidos’ is Greek for ‘form’. 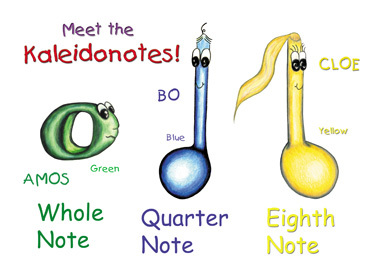 So the name ‘Kaleidonotes’ means ‘beautifully formed’ notes! At the time we made the book (2000-2001), we enjoyed creating a new, unusual word. Why is the viola not included in the orchestra? The violin and viola looked so similar in my illustrations that we decided to leave the viola out so we could create a second book called: The Kaleidonotes & the Vanishing Violas. That story explores the differences between a violin and viola, and it explains why the viola is so important to the orchestra. The second book is still not published because we are debating whether or not to redesign the size and shape of the books as a series. With the increasing popularity of e-books, we are even considering publishing as e-books and possibly creating interactive Apps for iPad or the iPhone. Click on the image to view full size then download and/or print. Print the page above and below. 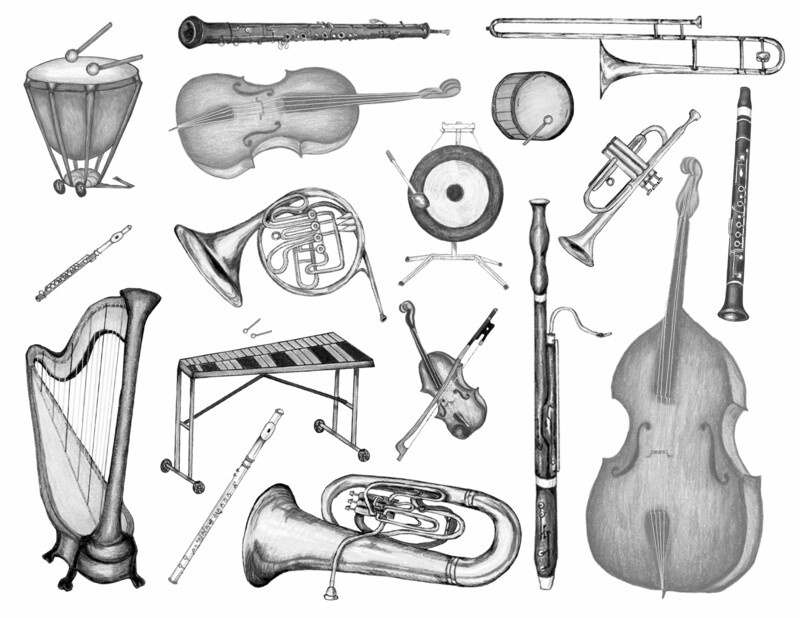 Color and cut out the instruments and place them in their appropriate place on stage on the orchestra map. Both images were designed to print ‘landscape’ (11 x 8.5 inches), but you may want to enlarge the map on bigger paper (17 x 11) to accommodate the larger instruments. 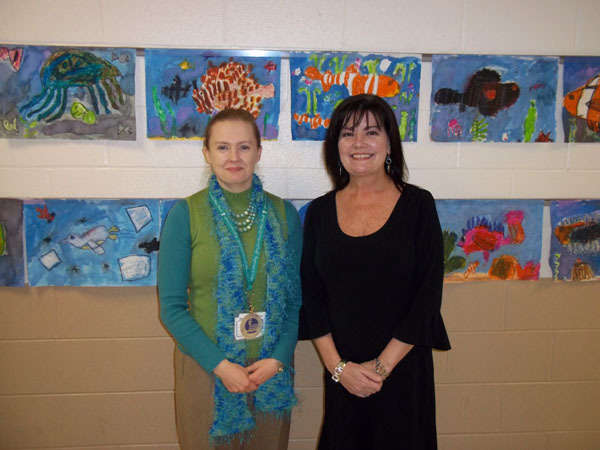 I visited Crockett Elementary in Franklin, Tennessee on January 18th. They have over 640 students in pre-k through 5th grade, so I set up in the gym where I spoke to one grade level at a time. 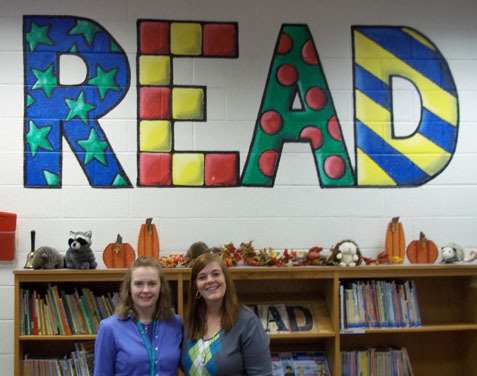 Tammy (left) and Crockett's Librarian, Julia Andrews (right). 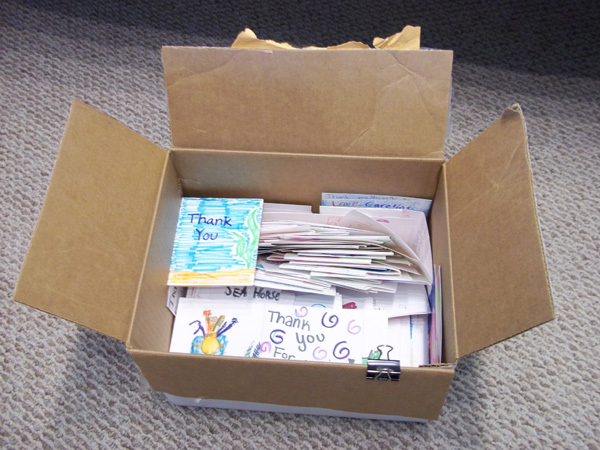 The librarian, Julia Andrews, prepared the students for my visit, introduced me at the assemblies, and provided me with lunch. I really enjoyed her tour of their amazing library. 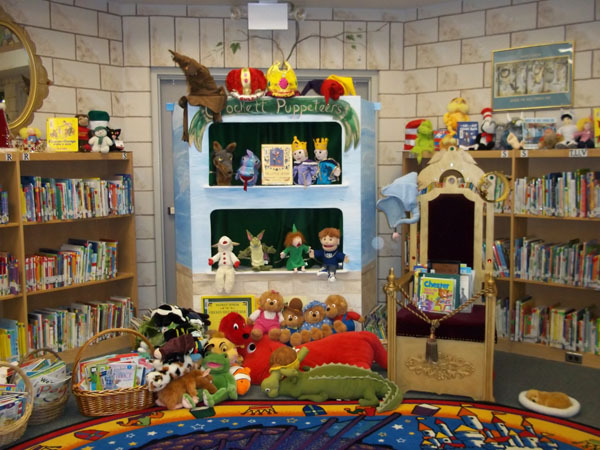 Many of the books are organized by topic. 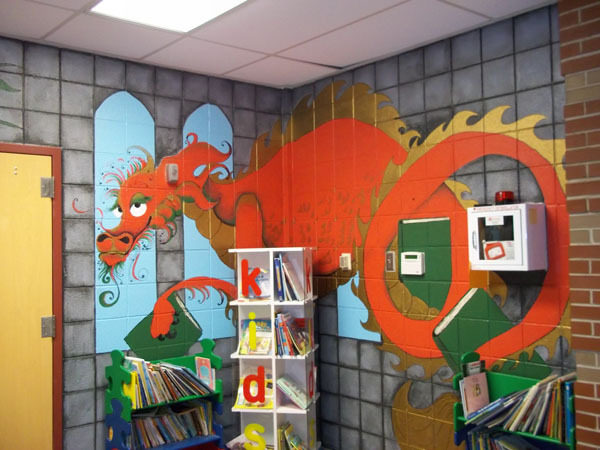 Books in a series have their own shelf. So do the “Princess” books! 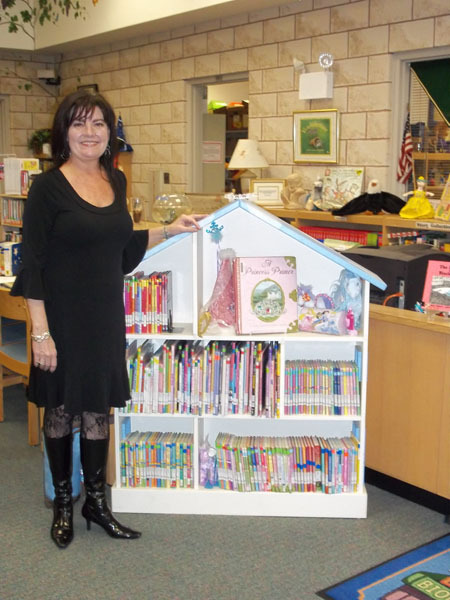 Ms. Andrews and her shelf filled with "Princess" Books. 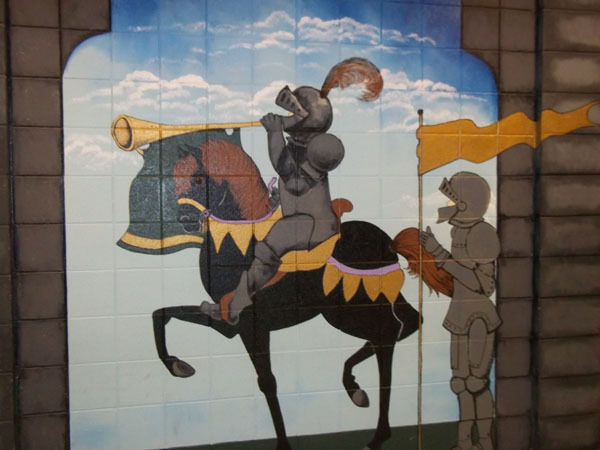 Ms. Andrews painted the walls to look like a castle. 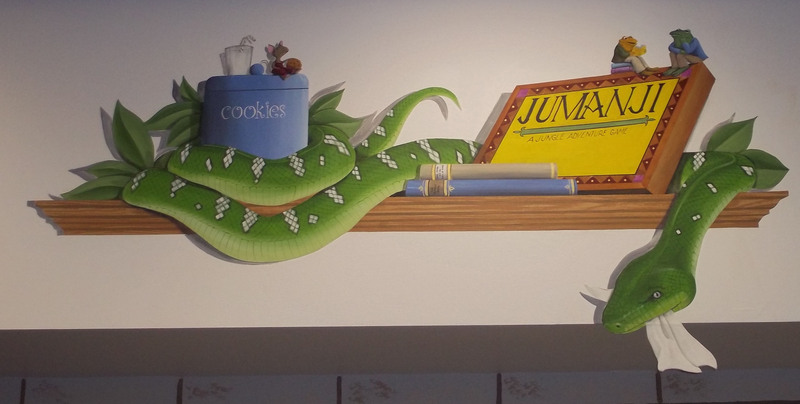 The murals were painted by another artist, but Ms. Andrews designed each mural with a variety of characters from beloved books. Thank you Crockett Elementary for a great day! I look forward to my next trip to Franklin, Tennessee. 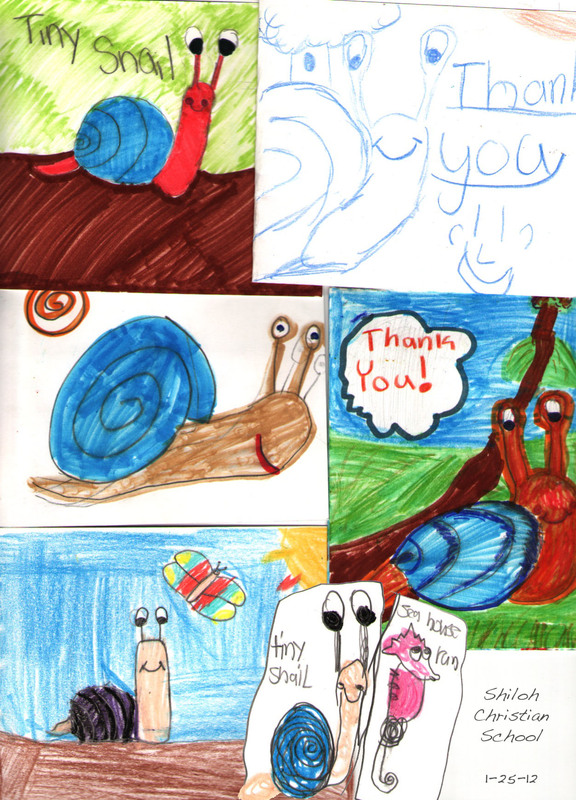 Mrs. Daniel’s 4th grade class at Nolan Elementary (Signal Mountain, Tennessee) gave me a wonderful set of pictures based on my books. 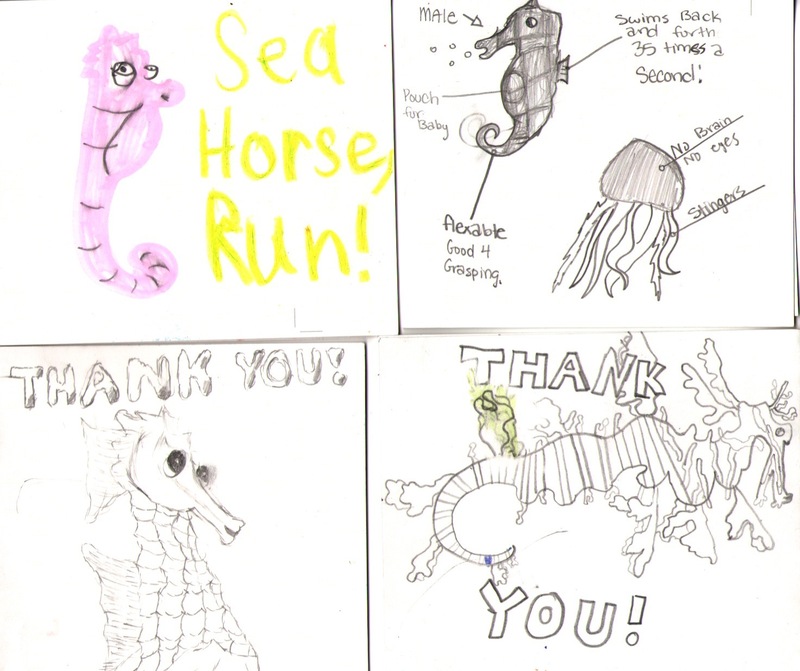 Here is a sample of their work and answers to their questions. 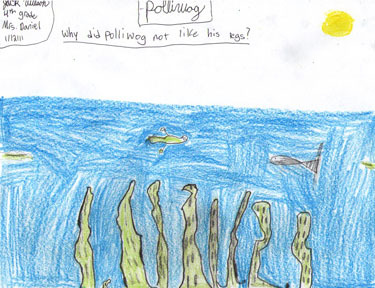 Great question, Keegan! Coral is not a plant. Coral looks like a plant, but she is actually a group of tiny animals. A choir or chorus is an organized group of singers, and since Coral is an organized cluster of tiny animals, I thought she ought to sing like a choir. Preslee likes my jellyfish. 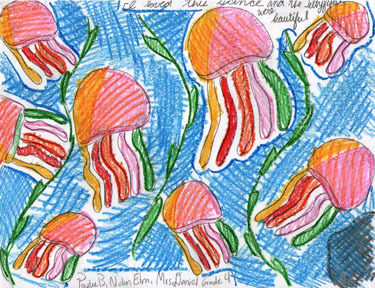 I like Preslee’s jellies (above), too! 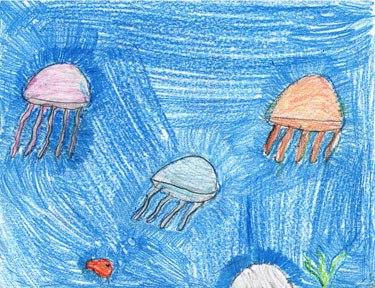 Jellyfish can be a symbol for acceptance, so the appearance of jellyfish before the story even begins foreshadows or predicts that acceptance will be an important theme in the story. 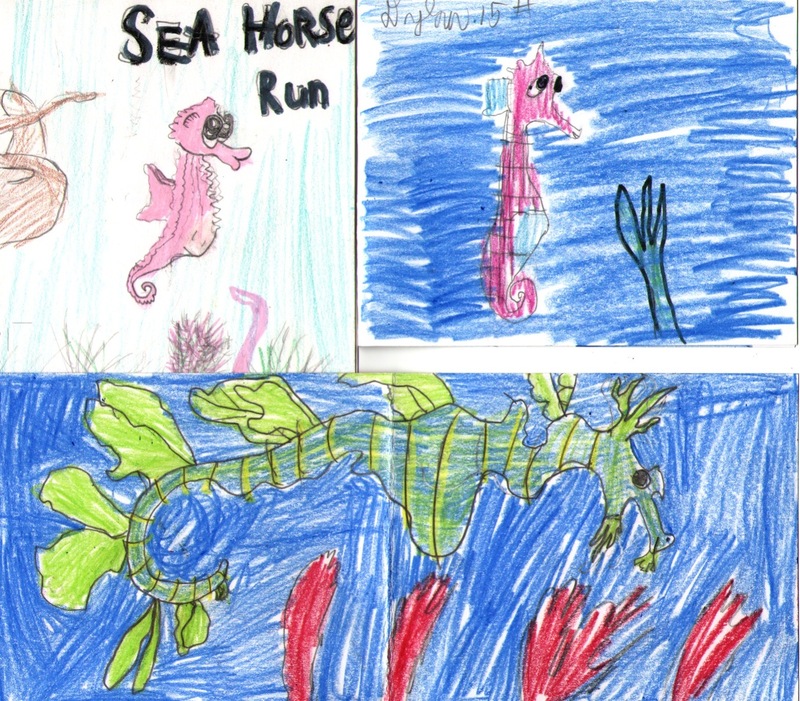 The poor Sea Dragon is misunderstood! 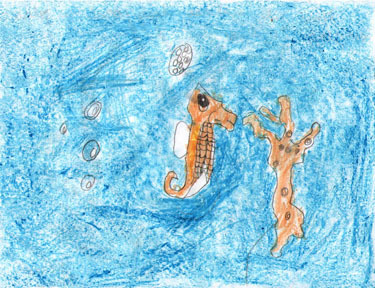 Sea Horse learns to ignore gossip and accept Sea Dragon for who he really is. 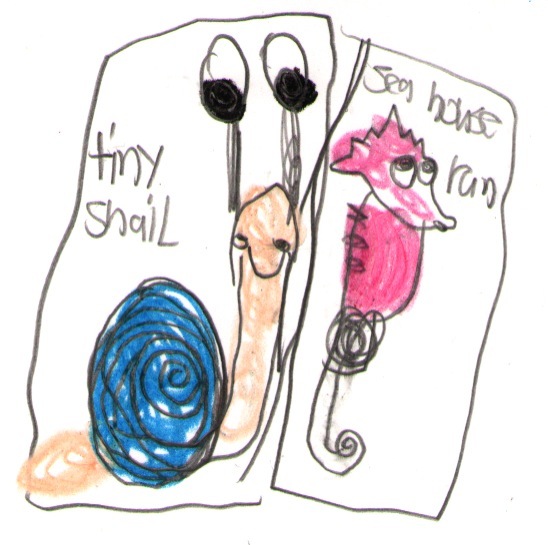 Mae Mae says, “I love that you write about animals.” I love Mae Mae’s snail (above). Scroll down for the answer (after the next picture). 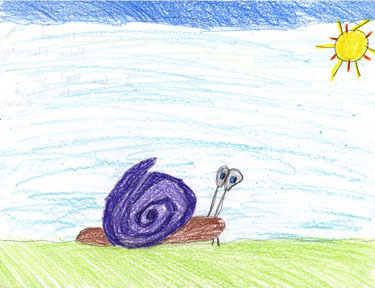 I chose a snail because I wanted to write a story about perseverance which means continuing toward your goal even when you’re discouraged or experiencing hardship. 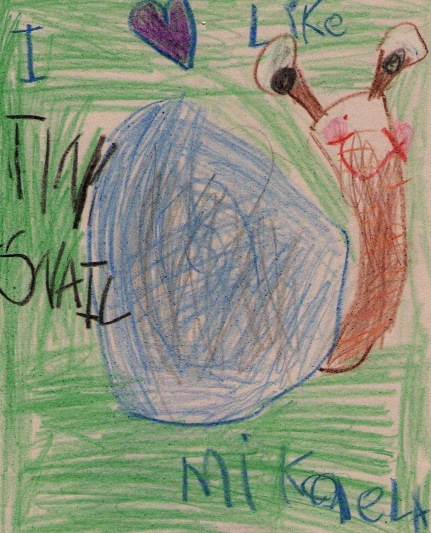 Snails are a symbol of perseverance, and since I didn’t see many books about snails, I knew TINY SNAIL would be a great book! 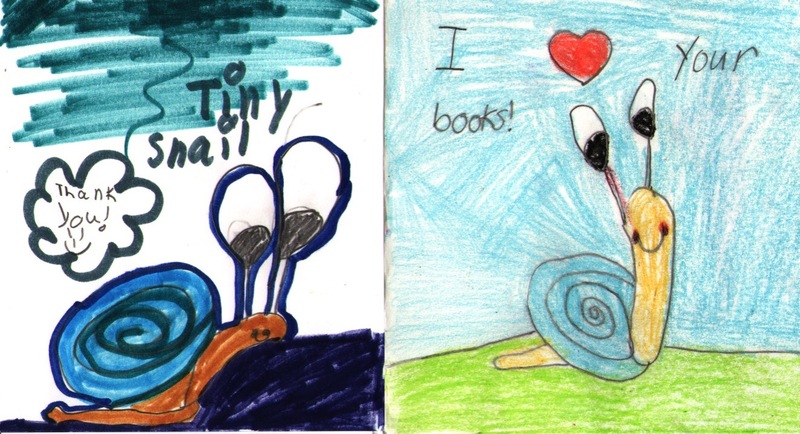 Sara likes the characters in POLLIWOG so she drew them (above). 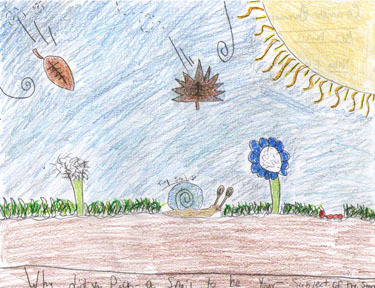 Jackson’s picture says, “I really like how you use the details in your drawings.” Jackson, I love your details, too! 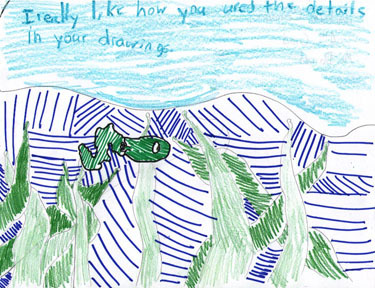 Your use of line and color is wonderful. I like how you filled in the water with blue lines and divided the water from the sky. This is a great picture. 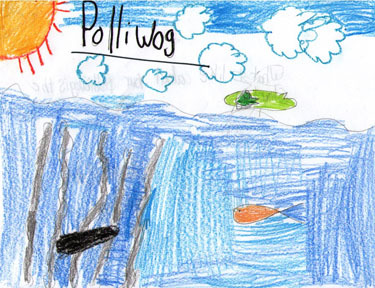 Polliwog was born a tadpole without legs. 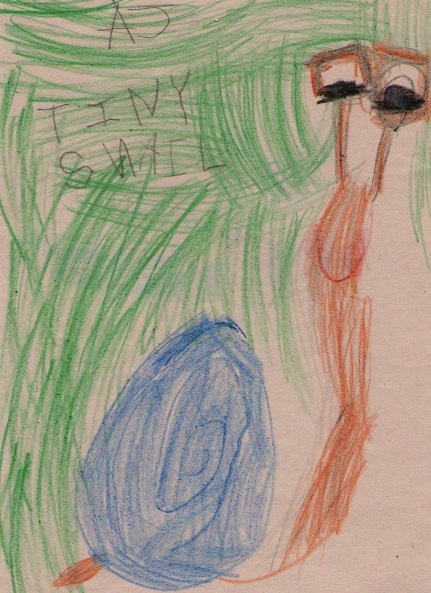 She used her tail to swim, and when she suddenly grew legs, she didn’t know what they were for. Her new legs scared her. Why would she need legs? 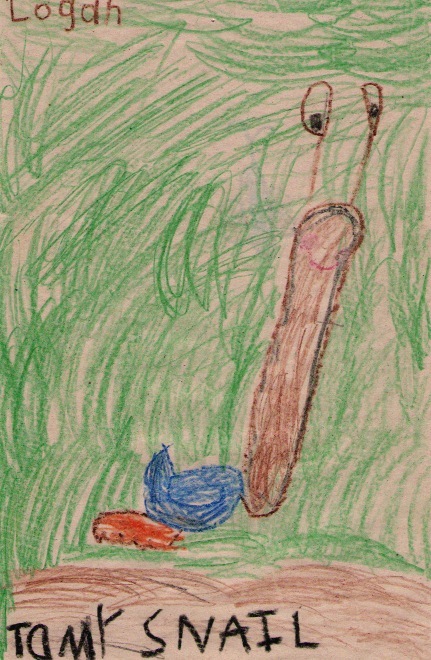 Of course she would need them when she left the pond, but remember, Polliwog did not want to leave the pond. She wanted to stay in the pond forever. Many thanks to Mrs. Daniel’s 4th grade language arts class for drawing such wonderful pictures and asking great questions. I’m so glad you enjoyed the stories! 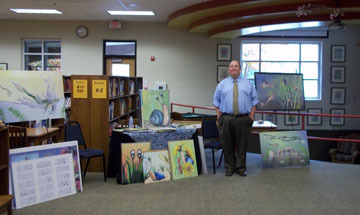 My visit to Nolan Elementary on Tuesday, 17 January 2012, was a great success thanks to PTA member Melissa Barrett. A former teacher, Melissa is the Classroom Enrichment Chair for Nolan PTA, and she did a fabulous job preparing teachers and students for our visit. 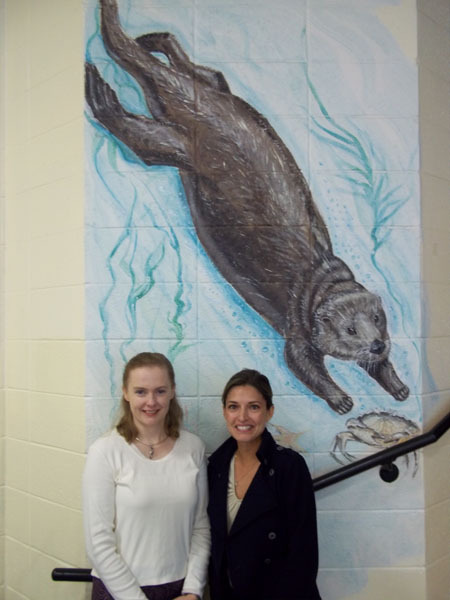 Melissa Barrett, PTA (left) and Tammy. 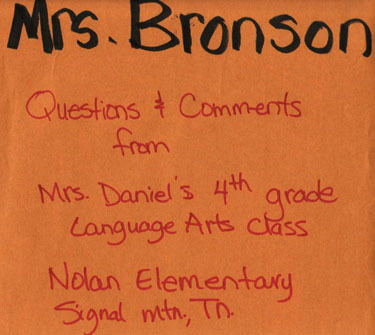 Home of the Knights, Nolan Elementary has an enrollment of approximately 679 students in grades K-5. Perched atop Signal Mountain outside Chattanooga, Tennessee, the school’s picturesque setting is surely an inspiration for both students and staff. 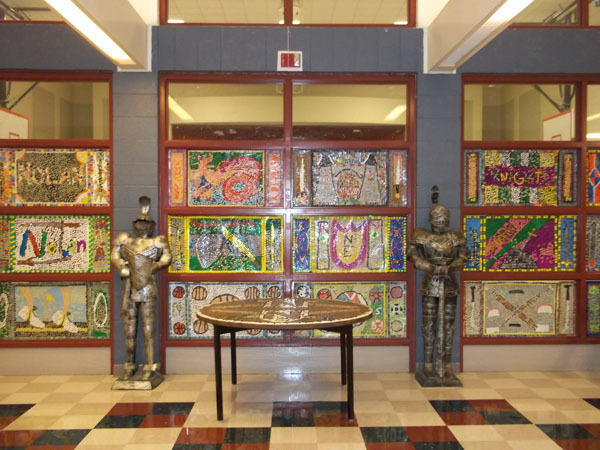 Mosaic art by Nolan students in the auditorium windows. 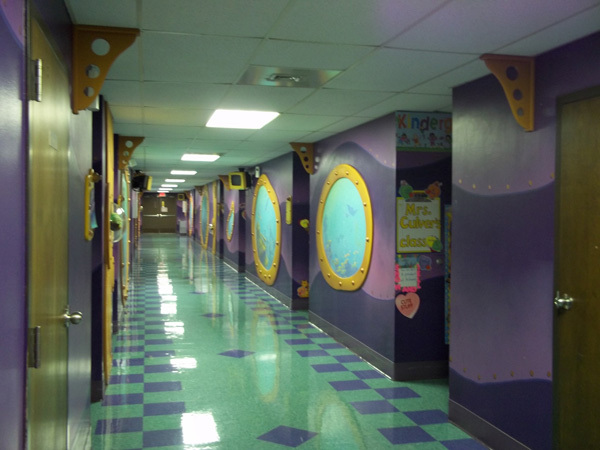 The halls and windows inside the school are covered with murals and student art. A reading nook near the Nolan office. 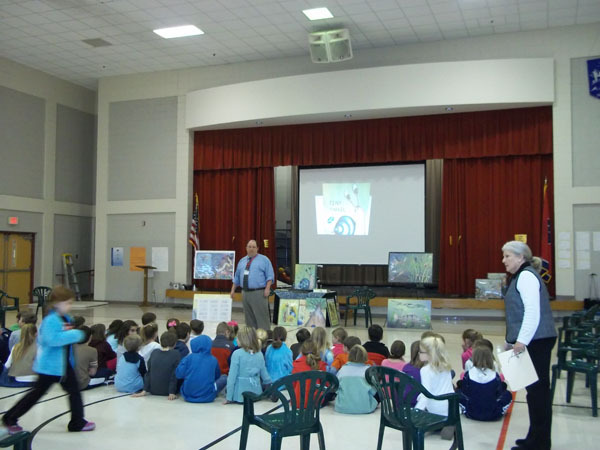 We had a great time speaking with grades K-5 about writing, illustrating and publishing children’s books. Thank you Nolan PTA for inviting us to your school!